Given the proliferation of information and the lifelong importance of information literacy skills, there is a need to determine how to best design information literacy instruction in order to help students locate, evaluate, and use information more effectively. This experimental study examined whether information literacy skills instruction designed using the I-LEARN model increased student understanding and application of information literacy concepts as compared to how librarians currently provide information literacy skills instruction. 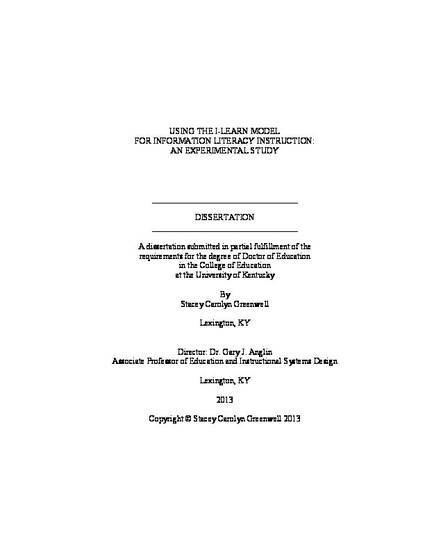 The experimental group received an instruction session and an online library research guide designed using the I-LEARN model, and the control group received an instruction session and an online library guide designed using a systems model. The analysis of the results of pre- and post-test scores and scores on a citation analysis showed that there was no significant difference between the two groups.